This sermon was preached at the early service (with too many digressions, sorry! ); the later service was an “all-age affair” and so the talk was more participatory with visual aids. One visual aid involved asking children to come look into a case where I had a picture of a special saint… they opened the case, looked in and saw themselves in the mirror. Every child smiled… and it was as people left church and I greeted them by name prefixed by “saint”. It should cause our hearts and lives to smile that we are loved and liberated, made whole by God. How many saints do you see around you this morning? Of course in some churches and other places of worship saints and saintly people are celebrated in stained glass windows, elegantly written epitaphs and sometimes gorgeously sculptured monuments. But, putting these possibilities aside, how many saints do you see around you this morning? Well, I see as many saints as I see faces (including the couple of faces I cannot see behind the altar; oh and maybe even mine as well). Over the centuries we have succumbed to the delusion that saints inhabited an exalted landscape and breathed a rarified atmosphere. With doubtful modesty strengthened by erroneous theology and suspect anthropology we have strayed from the Biblical (both Hebrew and Christian Scripture) truth that sainthood is not only accessible but also actual… today, right now. When St. Paul writes to the Christians at Corinth he knows them to be a… naughty group of people. They argued, they were immoral, they compromised, they vacillated… it was to them that he needed, of all the churches, to write the glorious hymn to/of love (“though I speak…”). And how Paul addresses the Corinthian Christians so he addresses all those who receive his letters… no matter the degree of malfunction, no matter the degree of waywardness, no matter the degree of rebellion… he names, nominates and declares them to be “saints”. Friends, our problem is that we begin too much from our own perspective and far too little, far too rarely, do we consider ourselves from God’s perspective. His is always the initiative, the preemptive strike, the first cause and so today (Isaiah 25:9) we are told that “God destroys the shroud that is set over us, that God wipes away tears from our eyes, that God saves us as we wait for him”. It is in our very passivity that God is at work and determines our status as saints! His is always the initiative, the preemptive strike, the first cause and so today (Revelation 21:6) “Behold, I am making all things new”. It is in our very passivity that God is at work and determines our status as saints. And in our Gospel for today (John 11) we see a saint in the making – Lazarus, he who knows full well the weakness of his flesh and the creative power of his Lord. Now, as Anne Marie reminded us in a different context last week, there is a crucial distinction between resurrection and resuscitation. Lazarus in our Gospel story is not resurrected, he is resuscitated to die again one day… and I sometimes muse whether Lazarus somehow, in some way, regretted that he had been called back but called back he is and he walks in the knowledge of two great truths – He is Loved and He is Liberated. The first great truth… He is loved… John 11:3 “Master, the one you love so much is very sick”… the one you love so much. 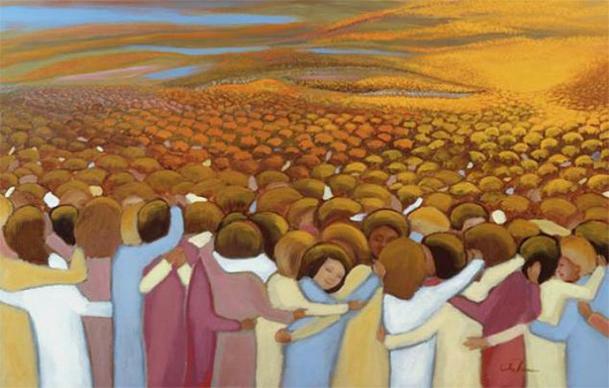 The defining mark of sainthood is to be loved by God; the transforming energy of sainthood is to know that we are loved. Stones/barriers to life in abundance are rolled away and the bands/the cords that hold us back from living and loving are broken, stripped away. The defining mark of sainthood is to be liberated by God; the transforming energy of sainthood is to know that we are liberated. “For freedom, Christ has set us free…” (Galatians 5:1), “You shall know the truth and the truth shall make you free” (John 8:32). This side of eternity we often relapse but our citizenship in heaven is secure, our status as saints is solid. Of course at All Saints’ we remember those who have died… who stand on a distant shore, those whom we love but see no longer. Friends, these are those who witness and testify and affirm to us that the love of God is boundless and the liberation of God is thorough. And so I speak to you, and to myself, as saints of God… let us thankfully receive these gifts of love and liberation today, open to radical change in ourselves, in our church, in our family, in our community.